The difference between a healthy peanut plant and a diseased peanut plant. 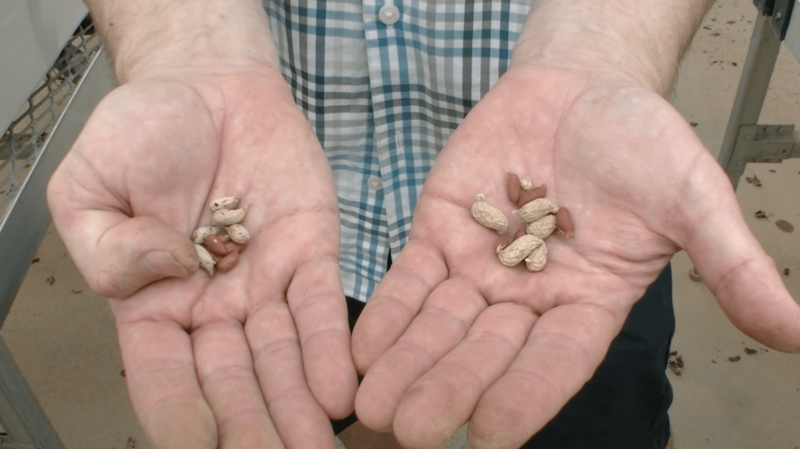 Peanut farmers in Georgia are yielding their largest crop in nearly two decades. According to Dr. Darlene Cowart, the Corporate Director of Food Safety and Quality at Birdsong Peanuts, said that simply there were more planted acres throughout the state of Georgia this current season. But, that isn’t the only reason why the yield is so high. For most farmers, including South Georgia peanut farmer Andrew Grimes, weather is always the biggest concern. However, the weather and other environmental factors have been ideal this farming season. According to Cowart, the current environmental factors created perfect idea growing conditions. At the UGA College of Agriculture and Environmental Sciences, researches are working to develop peanuts that are more resistant to diseases, which could continue to lower costs and prove higher crop production for the peanut industry. The goal: to successfully cross breed peanuts with ancestor plants that could help make the peanut crop more resistant to diseases. By blending the genes of peanuts with plants already resistant to certain diseases would further eliminate the need for pesticides and fungicides. Healthy plants could greatly reduce the production costs for farmers, that in turn, would allow for more planted acreage, and a higher yield of a healthy peanut crop. In turn, the University of Georgia is hosting a Field Day in Tifton, Georgia, next Wednesday, where peanut and cotton scientists will showcase their research, answer questions, and give updates on what’s going on within both of the industries, like the research being conducted here at the UGA College of Agriculture and Environmental Sciences in Athens, Georgia. Great news! Peanuts contain vitamins, minerals, nutrients and anti-oxidants. It lowers bad cholesterol and increases good cholesterol in the body.